with a gallon size jug! Ionic Copper is an all natural mineral supplement in the form of ionic copper ions of 0.9999 pure copper in pure deionized water. 0.9999 pure copper in ionic form. Ionic Copper is an all natural mineral supplement of copper consisting of of 0.999 pure copper suspended in pure deionized water. Copper is an essential trace element for humans and animals. Although Hippocrates is said to have recommended copper compounds as early as 400 B.C., scientists are still uncovering new information regarding the functions of copper in the human body. Copper is an essential trace mineral that facilitates the activity of several enzymes. The mineral provides a role in the development and maintenance of the cardiovascular system, including the heart, arteries, and other blood vessels, the skeletal system, and the structure and function of the nervous system, including the brain. Copper is a critical functional component of a number of essential enzymes, known as cuproenzymes. The copper-dependent enzyme, cytochrome c oxidase, plays a critical role in cellular energy production. Another cuproenzyme, lysyl oxidase, is required for the cross-linking of collagen and elastin, which are essential for the formation of strong and flexible connective tissue. The action of lysyl oxidase helps maintain the integrity of connective tissue in the heart and blood vessels and plays a role in bone formation. A number of reactions essential to normal function of the brain and nervous system are catalyzed by cuproenzymes. Copper is involved in respiration and the synthesis of hemoglobin. It is essential in the production of collagen and the neurotransmitter noradrenalin. It is an important blood antioxidant and prevents the rancidity of polyunsaturated fats. Copper is involved in numerous enzyme systems that break down or build up body tissues. It plays a role in the production of the skin pigment melanin by converting the amino acid tyrosine. The mineral is essential for the synthesis of phospholipids, which are a component of the myelin sheath that surrounds nerves. Copper works with iron in the development and maintenance of red blood cells and their protein hemoglobin. Unlike MesoCopper, Ionic Copper has a noticeable metallic taste ! Ionic Copper contains 33 parts-per-million (PPM) of copper ions. Supports healthy cartilage and tendon regeneration. Plays a critical role in cellular energy production. Helps maintain the integrity of connective tissue in the heart and blood vessels. Plays a role in bone formation. Plays a role in the metabolism of the neurotransmitters norepinephrine, epinephrine, and dopamine. Necessary for normal iron metabolism and red blood cell formation. Copper is known to play an important role in the development and maintenance of immune system function. Copper increases the body's ability to absorb iron. Ionic Copper is manufactured in an FDA registered facility, contains only pure water and pure copper and is non-toxic. See Material Safety Data Sheet (MSDS). 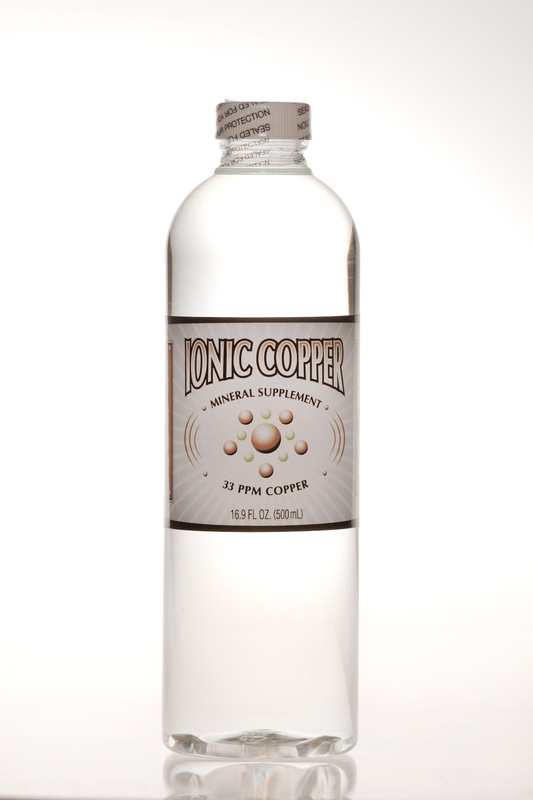 Ionic Copper has a limited shelf life, typically 4 to 6 months, once the bottle is opened. For this reason, it is best to purchase a bottle size that you would expect to consume in 4 months or less. You should not use this product if you are allergic to copper! Copper should probably not be taken by individuals with hemochromatosis because copper increases the body's ability to absorb iron. Hemochromatosis, the most common form of iron overload disease, is an inherited disorder that causes the body to absorb and store too much iron. The extra iron builds up in organs and damages them. Without treatment, the disease can cause these organs to fail. More on the importance of copper here. Allergic reactions to copper, while not unheard of, are uncommon. Someone having an allergic reaction to copper would not be able to handle a metallic copper object such as copper jewelry without causing an allergic reaction. Those who are uncertain if they are allergic to copper should apply a few drops to the back of the hand to see if an allergic reaction results. The dosage for Ionic Copper is typically one tablespoon (15mL) daily to help maintain health. Actual dosage will vary based on individual needs. A 500 mL bottle will provide one months supply when used at a dosage of one tablespoon per day. Ionic Copper is clear. There is no noticeable turbidity (cloudiness). 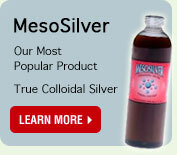 Why ionic copper when we make such a big deal about ionic silver NOT being good for ingestion? Answer: The non-noble metals of Zinc & Copper are converted to ionic form by dissolving in the stomach acid. This is NOT the case with Silver, Gold & the other Noble metals. In other words, Zinc and copper are different than Silver, Gold, Platinum, Palladium & Iridium. The ionic state of zinc and copper is the necessary form for use in the body. Why do you make colloidal zinc and copper if the ionic form is fine for ingestion? Answer: Many people find the metallic taste, especially of copper, to be quite objectionable. Also, there are benefits of the nanoparticles over the ions for topical application. Why is the colloidal form much more expensive? Answer: Our proprietary process has taken 30,000 man hours and millions of dollars of investment to produce. It is time consuming and difficult and, therefore, much more expensive than making a simpler ionic solution.